Last night was the gala showing of Chasing Legends, the new release by director Jason Berry. 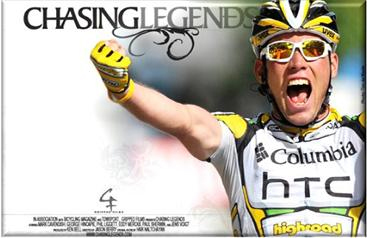 The movie, shot mainly in stunning HD, follows the HTC Columbia team through the 2009 Tour De France. Using a combination of fly-on-the-wall footage from within the team's inner sanctum, interviews with past and current legends, standard TV coverage and some vintage film, it attempts to convey the Tour De France as it is for the riders, team staff, support personnel and spectators. Although primarily focussing on sprinter Mark Cavendish's stage wins, the film delves into what the Tour has meant historically and tries to convey just why the Tour is the biggest annual sporting event in the world. Chasing Legends is a visually stunning movie. The Tour provides the most spectacular stage set for the drama unfolding before us and the director uses that backdrop to great effect. From the prologue in Monaco to the high mountains to the dramatic finale on the Champs Elysee we are treated to some stunning cinematography much of which shows the Tour from angles not normally seen in regular coverage. For me some of the static shots taken from spectator angles were the most unique. At one point the camera views a stage finish from a vantage point atop a building, looking from behind the riders as they cross the line. It's a perspective I've never seen before and really drove home the number of people within the race entourage, and behind the crowd barriers, that greet a stage winner, which in turn emphasised the rarity and importance of that stage win. Equally revealing is the sequence highlighting the role and daily reality of the motorcycle borne photographers on the race. By attaching cameras to, and following, snapper legends Graham Watson and Tim DeWaele, the director has captured the dual pace of their world. You see high-octane, helmet-cam footage of the motos weaving through the heart of a full speed peloton careering off the side of the high mountains. That adrenaline fuelled excitement is intercut with the technical brilliance of their talent for freezing the action around them into the stunning photos we've all come to expect in our monthly and weekly mags. While the Tour itself is the real star, the insights we get into the HTC team put a human face on it. We see team meetings where we learn riders nicknames (Mark Renshaw really does look like "Prince Harry" but I'm not sure Tony Martin looks like a "PanzerWagen") and find out how tactics are discussed and decided. There is also plenty of in-car footage showing the sometimes all-powerful but often helpless roles of team directors, Brian Holm and Rolf Aldag, not to mention the personal dynamics between two alpha-males stuck together in a car for seven hours every day for a month. There is no doubt that the directors lucked out by following the world's fastest sprinter while he was on top form, so there are some great sequences building up to the climax of Cavendish's missile-like lunges for the line and the team celebrations afterwards. However, probably the most dramatic events happen on the stage in which George Hincapie missed out on the Yellow Jersey by a mere five seconds. On the other hand, that section of the movie also highlights what for me is one of it's weaknesses. While we are able to share in George's disappointment, and are left in no doubt that the blame lays at the door of the Garmin team, there is no attempt to balance the accusations flying about by finding out why Garmin might have ridden like they did. The focus on the HTC team, who have pretty much put all of their eggs in the Cav basket, means that none of our "heroes" feature in the battle for the overall classification. As a result probably the most difficult and most significant stages of the Tour, the mountain stages, are glossed over as mere survival days. While it's nice to get the perspective of the "bus", those of us who follow the Tour know that there was some pretty serious drama happening at the front of the race that year. As far as this movie goes the Contador v Lance powerplay might never have happened. By concentrating on the harmony within the HTC camp, I feel the film misses a chance to show the other side of the story. All top level sport involves politics and Astana that year was a great case study in that. Having said that, Chasing Legends is a spectacular movie. It is beautiful to look at and the pace is frenetic but at the same time the Tour is shown due respect and deference. As cycling documentaries go it's definitely one of the best. Following the screening there was a live link to London, where Phil Liggett was standing by to interview the director, Jason Berry and the stars of the show, Mark Cavendish, Brian Holm and Rolf Aldag. This part of the night was just as entertaining. Holm admitted that despite himself and Aldag hoping their movie debut would portray them as being like Johnny Depp and Brad Pitt, they came out more like Stan and Ollie. But he was being modest! These guys have been around the block and their depth of knowledge was clear both on screen and during the discussion. However, the show was stolen by Cav. Love him or hate him, this young man always has plenty to say and last night was no exception. He's sometimes disarmingly frank but, when the norm these days is for sportsmen to either not comment at all or to spout a stream of "game-of-two-halves" clichés, Cav shoots straight and worries about the fallout later. He made some very interesting comments on the doping situation. His take was that the bulk of the peloton is now riding clean which is why we've seen so many bunch or group finishes in big races this year, unlike in the past when you used to get "great" exploits from riders like Ricco (he name checked the Cobra in particular which says a lot!). Cav feels that making races harder, as is the trend, is only going to increase the chances of group finishes because, in a clean world, riders are simply too tired, or too scared, to break away. While that was positive news to hear from one of the leaders of the bunch, the effect was undone a bit by the most ridiculous comment of the night. Liggett finished things off by asking Aldag and Holm what their best Tour memory was. Aldag, not surprisingly, said his was winning the team prize with Telekom. Then there was an audible intake of breathe in the cinema when Holm revealed that his was when fellow Dane, Bjarne Riis, won the race in 1996. Does this guy not read the papers!